Local Rock Garden Clubber David Shaw told the Gurn: "The Scottish Rock Garden Club will hold its 47th annual Highland Plant Show in the Community Centre on Saturday 30 April. The show is organised by the local Highland Rock Garden Group and was originally staged in Inverness, at various venues, until the new Nairn Community Centre opened and has been at this venue ever since. kind in the north of Scotland. It has proved increasingly popular with local people who come to admire some well grown examples of hardy perennial plants, bulbs and small shrubs. 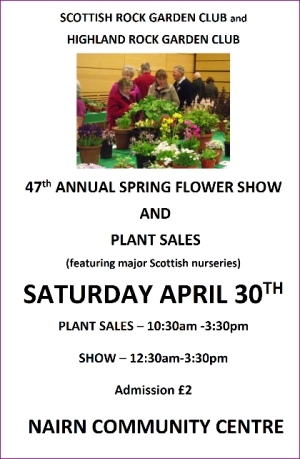 In addition to the show there is a large plant sales area with trade stands from Rumbling Bridge in Fife, Ardfearn at Bunchrew and Askival in Fort Augustus, all selling locally grown hardy plants. In addition there will be the Highland group’s members stand with an eclectic range of plants kindly donated by members. If you want to try to ‘grow your own, why not have a rake through the hundreds of packets of seeds available at a very low price. Soup, sandwiches, bakes, tea and coffee are provided by the sports club. The plant sales area will open at 1030 and the show just as soon as the judges finish their judging which will be as soon after 12 noon as possible. Why not come along and enjoy your Saturday with us and then spend Sunday planting out your purchases."